After four days in Luang Prabang, I’m heading back to Hanoi. With a half-day layover in Vientiane I’ve managed to find a cybercafe that lets me hook up my laptop to their high-speed connection, giving me a chance to upload photos. Check out my Flickr feed for a selection of highlights… and for future photos of Vietnam as I take them. 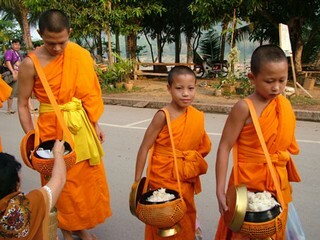 Luang Prabang is the ancient Lao capital from which the royal family ruled before Laos became Communist. While the regime can be nasty, buddhism and capitalism are more widely apparent than communism in Luang Prabang, anyway. collecting alms (food donations) for the day. These kids are keeping up with the 21st century, though. A couple of teenaged monks in flowing orange robes sat down next to me in a Luang Prabang cybercafe as I was checking e-mail. Unfortunately I didn’t have a camera with me, but my friend Jessica Smith did when some sat next to her. Jessica, her friend Rick and I stayed in a beautiful little hotel called the Apsara, run by an Englishman. I highly recommend it. Our visit happened to coincide with the Lao New Year. 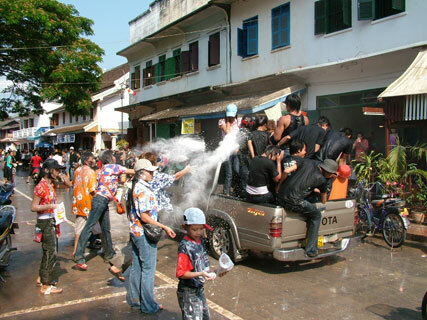 Celebrations involve parades in which everybody on the street gets splashed with water – and many people get flour and coal smeared on them as well. It’s a huge street party. This guy on the left had spent a long time living and working in San Diego. His family now owns a fish restaurant along the Mekong river and makes decent money. 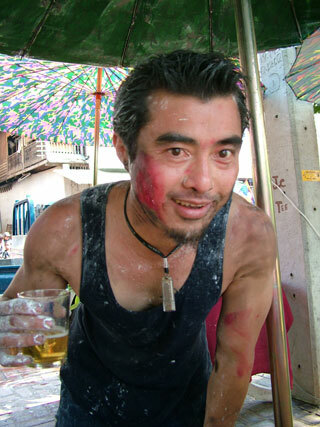 He carries photos of his girlfriend and of The Buddha around his neck in a flash memory stick. Cool idea. ...the collateral blocking of an additional 3,167 unrelated web sites raises serious concerns about the wisdom of using Internet filtering for national security purposes. South Korea's blocking clearly demonstrates one of the important, unintended consequences of implementing Internet filtering: thousands of websites that were never intended to be blocked, and that are completely unrelated to North Korea, have been filtered. Thus, South Korea is preventing its citizens from accessing thousands of sites as a byproduct of its efforts to filter out those that support North Korea. 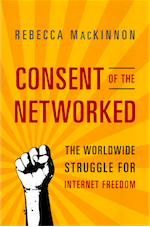 Censorship is futile in the internet age. Fight bad information with better information. Provide redress for those harmed by inaccurate and damaging media reporting. Amend the broadcast law to provide for more diversity of views. I'm not exactly sure what #2 would entail... sounds like lawsuit hell... but #1 and #3 seem to reflect a public demand for greater diversity of views in the national print and TV media - a demand that has been proven and legitimized by the popularity of OhMyNews.